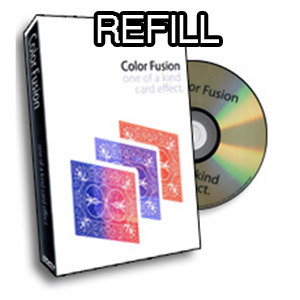 A refill set of 25 cards for the DVD Color Fusion by Eric James. Show the back, show the face, show it all. Want to hear something even more amazing? Directly after the change you hand the 3/4 card right to the spec, no funny moves, no nothing you just hand it right to them. They can even grab it right out of your hands (see demo). Wait, what's that you say? Wouldn't it be cool if you could fully restore the final blue piece onto the 3/4 red card? Why, yes that would be cool. Believe it or not we will teach you a routine to even completely restore the final piece onto the card!